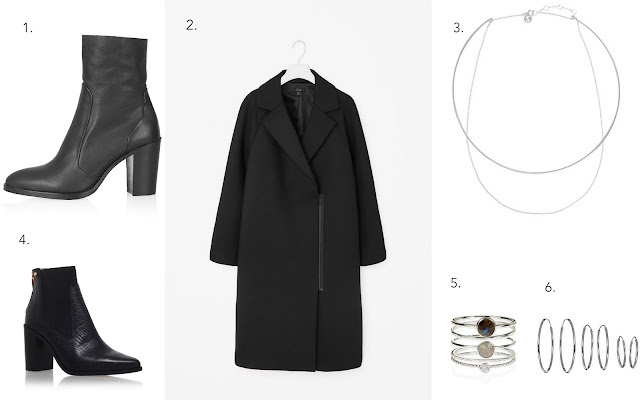 Boots, Black coat and silver jewellery is pretty much me summed up one post. Ive been lusting after all these items for a while now. I tried the coat on in Cos in London with me mum a few weeks ago and left is behind thinking I would be able to find something similar elsewhere but for less money, apparently not! I cant find anything else that matches up to it. The jewellery is much more attainable as the price is much less but the boots and coat are what I just can't get out of my head. Its my birthday in two weeks so hopefully if I save a bit I will be able to splurge on at least one pair then.